December 1st marks World AIDS Day, and thanks to major discoveries and continuous research into the field of pediatric HIV, young patients living with the disease can go on to lead full, long lives and with the help of treatments decrease their risk of transmitting the virus to their future children to practically zero. 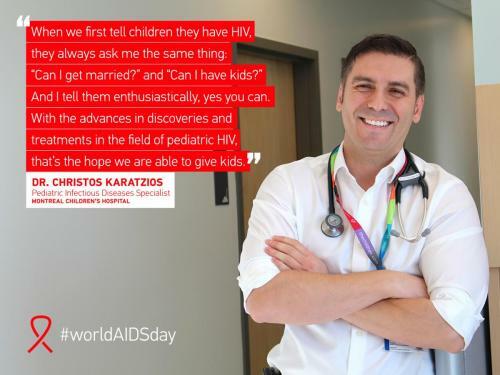 “We are now in a place, thanks to major advances and discoveries, where children who were first born with HIV are now in their 30s, and they are having families with uninfected children,” says Dr. Christos Karatzios, infectious disease specialist at the Montreal Children’s Hospital. HIV researchers are now zeroing in on the best way to keep the virus from triggering an active infection. Dr. Karatzios is currently a co-investigator in a study that looks at pediatric HIV patients from the Montreal Children’s Hospital and across Canada who were treated either early on at birth, or later in life to compare which method is most effective at beating back the virus and eliminating it from the body’s reservoir sites or hiding places. The findings could help uncover a “functional cure”, where virus levels are kept so low in these places that they won’t trigger an active infection, or could lead to a complete remission from HIV infection altogether. The aim of the study is to find more effective HIV treatments in the future, and perhaps eventually pave the way to a day where HIV can be rendered so ineffective that the patient is practically cured of it.